Russia reports that four Syrian soldiers killed by Israeli strikes, while monitor group says total of 11 people dead in attack. A total of 11 people were killed in Israeli airstrikes in Syria overnight, a monitor group claimed Monday morning. Israeli fighter planes hit a number of Iranian positions in Syria, the IDF said Monday morning, in response to the launching of a surface-to-surface rocket that was carried out on Sunday by Iranian Quds forces operating in Syrian territory. 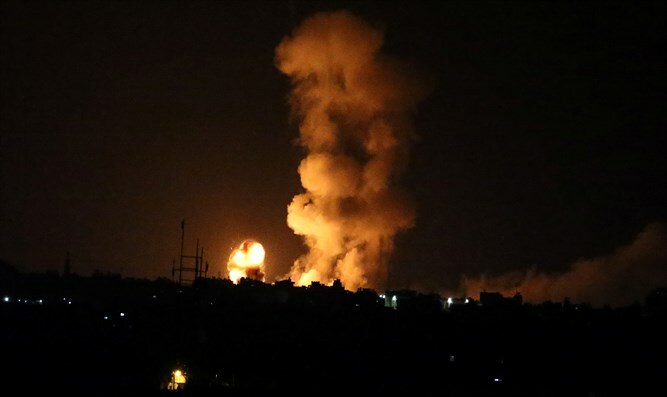 The targets of the predawn Israeli strikes Monday morning included Iranian weapons depots, an Iranian intelligence site, and a military training camp used by Iranian forces in Syria. The Israeli strikes also targeted multiple Syrian surface-to-air missile batteries. According to the UK-based Syrian Observatory for Human Rights, an anti-Assad NGO, a total of 11 people were killed in the Israeli attacks. Of the 11 people killed, two were Syrians, the SOHR claimed. "Israeli strikes targeting Iranian and Syrian military positions near and south of Damascus killed at least 11 fighters including two Syrians," SOHR chief Rami Abdel Rahman said. Russia’s military claimed four Syrians were killed in the attacks, with another six injured. It did not specify how many Iranians were killed in the strikes. The Israeli attacks included both fighter jets and long-range cruise missiles, Russia claimed, adding that Syria’s air defense network downed more than 30 Israeli missiles.